The teams met for the first time after training in Teyatanenang offices on Thursday the 17th March. The purpose of the meeting was to reflect on the basics of what has happened since the end of the training. Leribe were first to do anything, which was to hold a one day mapathon on February 25th, and they showed those who already knew how to map the new quality assurance tools .More like engagement that training, Qachas Nek had the wonderful idea of showing their top brass what they had learned and the quality assurance process as well as the outcomes of the road reservation analysis, which went ahead on the 4th March. 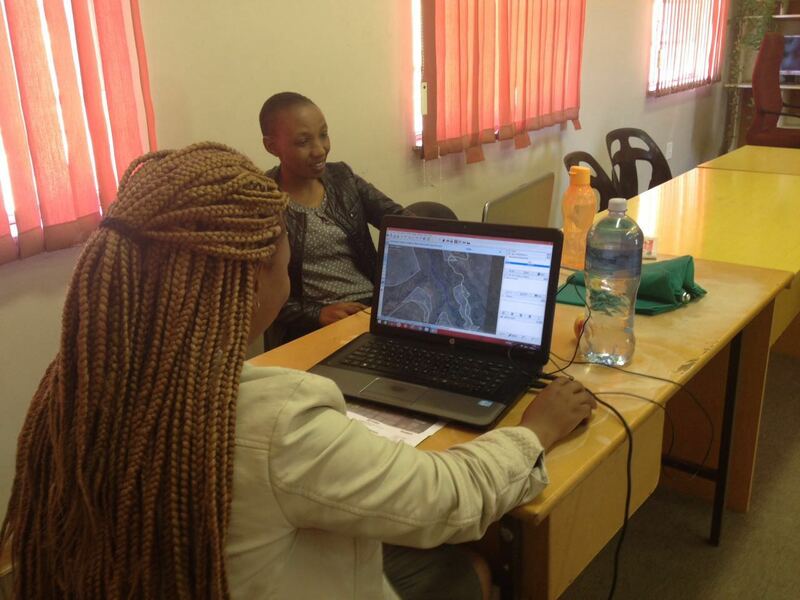 Mokhotlong came next, and had two consecutive training days and the result was First #MapLesotho Mapathon in Mokhotlong, which has its own write-up by Refiloe here. This was productive as six new mappers were created. The meeting of the trainees from 2016 in Berea was in two halfs…the first half a mapathon. Before lunch we signed up new users, and re-animated older ones, and I used the training methodology that I learned in February. Also there was an arrangement to train two of LAA Mapping section staff and LSPP surveyors to give them a general knowledge of mapping on osm and how the created data can be used. However, the two training sessions did not go as planned. In our training we discussed that trainers have to control the environment to effectively deliver to people who want to learn.That means non-trainees cannot have access to the rooms, but we are getting smarter and more organised every time! 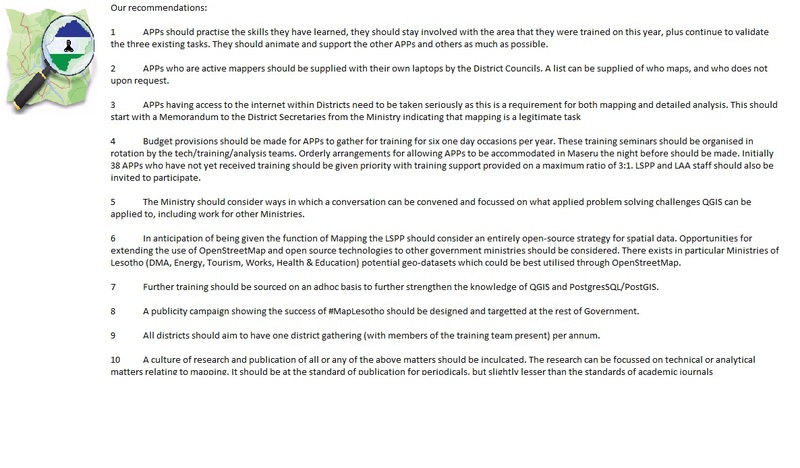 Two districts were identified that need urgent priority in training as no mapathons have ever been held. These district’s are Thaba Tseka and Quthing. 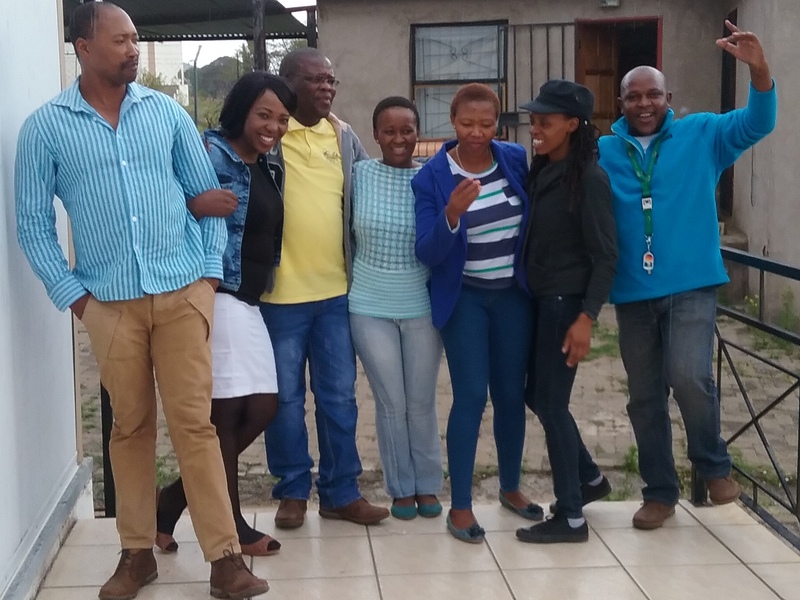 Of course not to be outdone, Qachas Nek had another meetup as a Mapathon, and that took place on the 18th March, which was good because it kept the momentum created in Berea and Mokhotlong going. Qachas Nek has good potential for mapping and getting the validation tasks done now, since the Urban office has wifi and there are several trained APPs who need to just do their district to make a huge contibution. The technical team gave us all feedback in Berea through their representative Mzwandile. They kept using the quality assurance tools in their respective districts at a steady pace. They did not need to meet face to face. However, they were able to see that roads need a lot of sorting out. They noticed as well that errors are common, or more common in places where the mapping hasn’t yet been validated. What Mzwandile said led us all to think that we need the validation done soon! The analysis team gave much the same feedback, that we need to have the tagging correct on everything so that they can extract the data easily from the database. Tshedy and Seitebatso were looking well into the future when they told us that tagging every kind of building and structure correctly allows them use their skills to the fullest. All of us need to remember that the use of the data to feed new decisions about the settlements of Lesotho is why we are doing this, and we are going to need the skills of the analysis team to do that. Looking overall the priority has got to be validation of the mapping done, and a quick move to the second phase. In that phase I hope that Maseru City is a task on itself because it was so large in the urban mapping. The three beardies’ from Fingal told us that we need Mapillary and field papers to do this work. I want to post an image of our recommendations from the trainers before they left. We are really beginning to get momentum with these things. Our Ministry will review this progress shortly. We will be blogging about that I think!